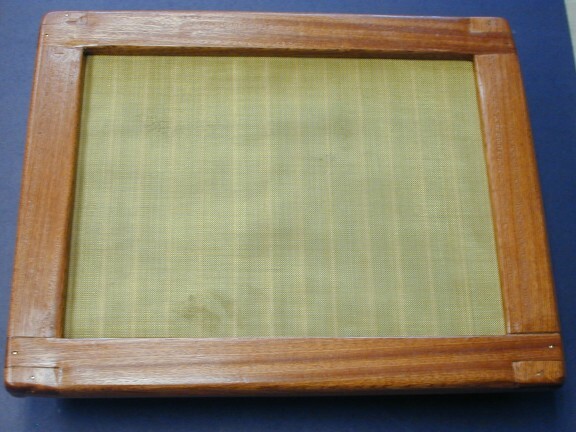 This mold and deckle set is a box with a screen cover and a removable wooden frame. It is a speciality tool for handmade paper making. Standing in front of a tank of paper pulp and water, you hold the mold and deckle together with you hands along the sides and dip it under the surface. You then raise it straight up depositing a layer of paper pulp on the surface of the screen. You then set the deckle set aside and roll the new paper off the mold using a paper couch and felt. More details of the handmade paper making process can be found in my description of a paper plant I built some time ago. After a long sabbatical, I am now building new version of most of the parts for the paper plant so that I can place the plans on the Web. Building a mold and deckle is a real challenge in woodworking. The deckle has a particularly difficult corner joint that requires a great many steps to make. The mold has a large number of support slats that must be identical and has four corner joints that must be strong and square. Because the mold and deckle are continually used around water. Woods, materials, glues, and finishes normally used in boat building are choose. The wood is traditionally mahogany for that reason and hardware is largely brass. The wood will have to come from a real lumber yard and the brass materials can be ordered over the internet. The cost, using all new materials, is about $100.00 for the wood and brass. The cost will be higher if you make larger units or, as is common, you make several sets at a time. When completed, the mold and deckle will be a key tool in any handmade paper plant. The overall size and construction of the mold and deckle are each shown. The paper size made with this set is 17.5" by 12" so the paper can be trimmed to 11" x 17" or a metric A3 sheet. You can make different paper sizes by adding length and width to all the appropriate parts. The deckle must fit loosely over the completed mold so that it will go off and on easily. It has an internal grove to cover the nails and metal strips that hold the brass screen on the mold. The corners are a complex finger joint requiring a number of dado operations to complete. One bottom edge of the deckle has a extra bumper strip of wood that makes use easier. The mold has closely space slats that will support the bass screen strongly and keep it flat. The screen is held on with small brass nails called escutcheon pins. All the wood starts starts out as unplanned mahogany one inch thick. It is then hand planed down to just under one inch. The deckle consists of two sides and two ends. You must first dado all the stock lengthwise and then use the dado again to cut the joints. 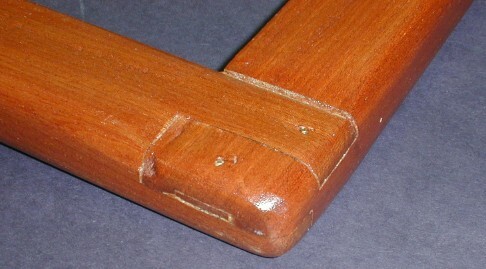 The mold is shown with simple dado joints. The classic mold joint uses large dovetails . The dado joint is acceptable only because of the availability of waterproof glues and brass screws. This sketch shows the steps needed to dado the stock to make the deckle. This drawing is full scale. This sketch shows the steps in making the deckle joints. This drawing is full scale. 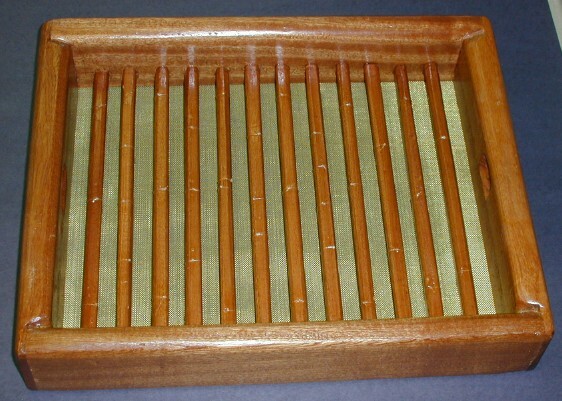 The mold and deckle are made from mahogany with brass fittings. The parts are assembled with glue, brass crews, and brass pins. The mail order source for some of the hardware is given below. This is only an estimate (made in Winter 2007). The price may vary in your area. Getting a good price on the wood and brass screen is critical to keeping the price down. This device was designed so that it could be built by one person with a modest home shop. Access to a table or radial arm saw is needed. Considerable skill in woodworking is required. Size -- The single example shown makes a sheet of paper than can be trimmed to 17" x 11" or metric A3. The customer will usually want a different size or perhaps several different sizes. You can systematically add length to all the pieces to adjust the size of the finished paper. Metric or SI -- If you need metric prints, email me. Build a practice unit -- This project is sufficiently difficult that you may wish to build a practice unit before committing expensive materials. Material substitutions -- You need to decide if you want to stick to the classic materials which may be difficult to obtain or substitute modern ones which are probably just as good or better. Sometimes the available screen is made of stainless steal instead of brass. Brass colored aluminum shim stock can be used to hold down the screen if brass is difficult to find. Hard aluminum nails may be used if real brass pins can not be found for love or money. Dovetail mold corners -- Classical molds have dovetailed corner joints. The dado joints shown here are are not as good. If you have access to a dovetail machine, then use it. Choice of Glue -- The glue must be water resistant but having it completely water proof is not actually required. You can use water resistant tan woodworking glue or a urethane glue like Gorilla Glue. The tan glue is stronger but not completely water proof. The Gorilla Glue is absolutely water proof, but is much weaker if the joints do not have exactly the right gap. The Gorilla glue is easer to sand. Choice of finish -- Classic mold and deckles were not finished at all. What you do not want is a finish that will later flake off and get into the paper. Polyurethane is very strong and long lasting but might flake after a few years. Tung nut oil finishes are more gummy and less likely to flake. Screen Size -- The screen should have between 24 and 28 wires per inch. Metal silk screen screens are much to fine. 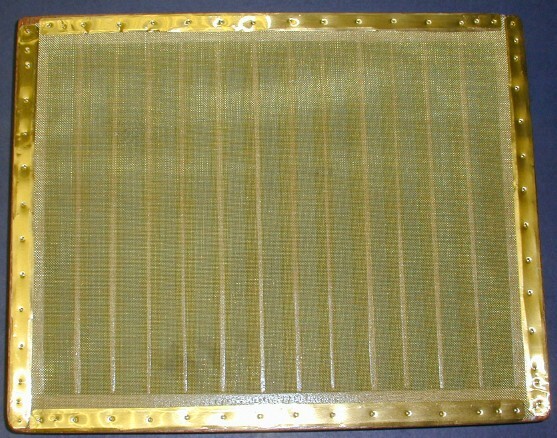 Hand woven screens -- A classic mold has a hand woven screen made from two sizes of brass wire. 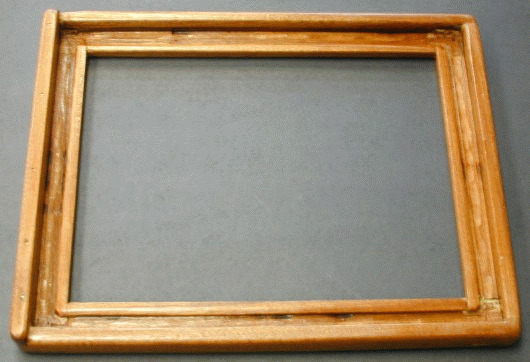 This type of screen leaves a distinguishing mark on the paper that is much valued. Such a screen can be made with a simple loom without too much difficultly. Email me if you want to build such a loom. The deckle is made first and the mold is then fitted to it. 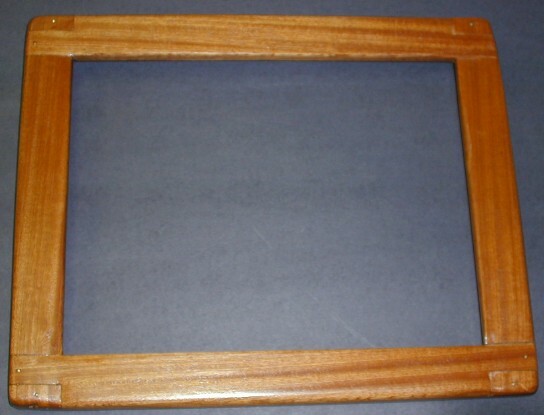 The deckle is basically a simple frame with a complex joint. Sketch #3 shows the steps in making the stock for the deckle sides and ends. First cut wooden strips 1.50" by 1.00" long enough to make either sides or ends and with an inch extra length. Make several passes with the dado to insure good control. Cut at least one extra piece and perhaps some more from scrap wood. The first dado removes a 1.00" by 0.50" grove down the entire length. This dado makes the inside wall that rests against the sides of the mold. The next to dados are full length on the sides but need to stop 0.50" short of the finished ends on the end pieces. You may either make the dados start-and-stop short, or you may dado all the stock the same and glue four small blocks into the the groves on the two end pieces. The required space between the inside edges of these blocks is shown in Sketch #2. Excess length for these blocks is easily trimmed later. The second dado removes a 0.75" by 0.25" strip off the entire length of the sides but again this slot should not break out of the ends of the end pieces. It needs to stop 0.5" short of the finished ends. This grove covers the pins and metal strips that hold on the screen. The final dado is a small one to reduce the height of the ridge that actually rests on the screen and defines the edge of the paper. Again it must either start and stop short or be filled by the block. If you have chosen to cut the dados full length, you now need to cut and glue in the end blocks. You will need to chisel away one inch of the small rest strip at both ends. The block grain should run in the same direction as the stock. Excess material in the block can easily be removed later. Getting the distance between the blocks right is critical. The glue needs to set over night before proceeding. This is the tricky bit. Cut the 0.75" wide dado on the tops of the deckle end pieces. The inside edge of this dado sets the width of the paper and must be exact. Dado the 0.50" by 0.50" grove at on the bottom of the deckle. This grove defines the outside dimension of the deckle. You can now trim off any excess material outside this grove. Trim the deckle side pieces to length. The deckle sides have two long fingers sticking out their ends. These are made with two dado passes with a 0.25" dado stack. One pass is top-to-bottom and one inside-to-side. You need to build jigs out of scrap plywood to hold the pieces for these cut. Practice on scrap first. Make several passes to build up to the full depth. Trim off the unwanted scrap to leave the two fingers. Trial fit the deckle joints. Check the inside dimensions. Clean up the ends of the small ridge so that the 0.75" channel goes completely around the inside of the deckle. Glue the deckle corners and clamp it so that it will be square. Allow to set overnight before continuing. Clean off excess glue and sand the joints lightly. Dado a grove along the bottom on one end of the deckle only and fit the bumper strip. Allow the glue to set. This strip defines the bottom of the deckle and bumps against the mold when the deckle is dropped on. The deckle now needs a fair amount of hand work. A cross-section of the finished shape is shown at the bottom of Sketch #3. All the outside edges need to be round off so that they feel comfortable in your hand. The inside of the bottom needs to be slightly beveled so that it will drop on the mold more easily. The inside of the small screen rest needs to be beveled so that only about 0.125" actually touches the screen. The inside of deckle top needs to be sloped significantly so the inside edge is less than 0.25" wide. This insures that water runs off the top of the deckle onto the screen. This task take some time to get the corners of the deckle to slope nicely. The mold is built to fit loosely inside the deckle. If you have access to a dovetail jig, use it instead of the dado joints shown here. The size of the mold pieces are shown in Sketch #2. Cut them a little long and trim them to fit your exact deckle. The mold must slide easily into the deckle but not slide around. The inside of the side pieces need a row of holes for the screen support slats. You may want to make the slats first so that you can be sure the top of the slats match the top of the mold sides. Be sure to sign your work. I hand carved my name and year into one mold end piece. There a great many wooden slats that support the screen. They are made from the same wood as the mold and have a teardrop cross-section. The thin top edge supports the screen without blocking it while the larger bottom provides the strength. Considerable force is placed on the screen in the paper making process so these slats must be strong. Cut uniform 1.00" by 0.50" stock to make the slats. Make at least three extra. Make to dado cross cuts on the ends of the slats to define a square post in the center. The distance between the shoulders at the two ends of the slat must be the exact distance inside the mold body and they must be all exactly the same length. Make pencil lines along the top of the slats to define a strip about 0.100" wide. Also make pencil lines about 2/3 of the way down the sides. Use these lines as guides to form the teardrop shape with a small sharp hand plane. Take a piece scrap of hard wood, like maple, and drill several 5/16" holds through it. Whittle the square posts on the ends of the slats round. Trial fit them into the hard wood holes and work them until they are a good fit, not too tight but not sloppy either. Sand all the mold pieces. Be sure to remove all pencil marks. The problem is to glue up the mold exactly square. You may want to make a gluing gig from plywood and scrap wood blocks to do this. A layer of newspaper between the mold and the jig will help make sure they do not stick together. The tricky bit is to get all the slats in place at one time. It helps that they if they all well made so select your best set of slats and discard the extras. Be sure to check that the shoulders are all exactly the same width apart. Clean up excess glue from around the slats as this area is very difficult to sand later. Allow the glue to set over night. Round off the bottom edges of the mold both inside and out. These need to feel comfortable in the hand. Sand all the glue joints. Check the mold face to be sure the edges and tops of the slats make a flat plane. Brass fashioners will greatly strengthen the corners of both the deckle and the mold. Brass screws are used for the mold and brass pins for the deckle. It would be best to add these during the gluing but the clamps and jigs get in the way so badly that it may be best to add the brass later. Test you brass pins with a magnet to be sure they are brass. Cut the head off one pin and use it as a drill bit to make pilot holes for the pins. Place one pin through each finger in the deckle corner joints near the end. Place three to five pins along the bottom of the bumper. Set the pins slightly into the wood to clear sanding. The mold gets two brass screws in each corner. Use a screwmate drill to counter sink the screw 0.125" into the end pieces. Cover the screws with wooden plugs. These screws are not needed for dovetailed joint. Finish your mole and deckle any way you like, or leave them unfinished. I used: a spit coat of shellac to improve finish adhesion, and three coats of satin finish polyurethane. Other people would prefer an oil finish like tung oil. A spit coat made of one part 3-pound shellac to five parts shellac thinner makes a good wood sealer. It helps the finish stick to the wood and reduces the chance of flaking later. At least three top coats are needed as the mold sees considerable wear in use. Sand lightly between coats. The next step is to install the brass screen. Rough cut the screen from the roll using tin snips. Place the screen on the top of the mold and flatten it in place with a piece of plywood and a weight. Carefully mark and trim the screen to be 0.125" inside the outer edge of the mold. Round the corners to a 0.5" radius. If the screen came off a roll, place the round area down on the center of the mold so you can pull two edges down with the metal strips. Tape the screen temporarily in place. Cut four strips of thin brass or aluminum about .375" wide and as long as the sides of the mold. Trim them to length so that they fit nicely around the top of the mold with a thin show of wood but completely covering the ends in the cut brass screen. Round the ends. It is a good idea to take a hand brake and bend the edges of the metal strips down slightly like a [. This strengthens the strips and helps cover the wire ends. Draw a pencil line down the center of the strips and mark off a point about every 1.0". Punch a small hole on every mark. Make a drill bit by cutting off the head of a brass pin or better yet the head of a steel finishing nail the same diameter. The pins need to be drilled for about 3/2 of their length but no more. A small square of paper pushed over the bit can help keep the end of the drill chuck from marking the metal strip. Place one of the end strips in place and drill a hole though it and into the mold end piece. Avoid starting right on top of the wood screws. Remove the tape from underneath the strip and tack down the first brass pin. Move up the strip from the first pin carefully placing the strip for a few holes, drilling those holes, and then tacking down the pins. Angle the holes directly over the screws in the mold joints slightly to miss them. Continue the same way on the three other strips. Do one side and then the other. Finish with the other end. Trim the wires on the edge of the screen if necessary to keep them from sticking over the edge. You may want to double up the pins at the ends of the strips for extra strength. The screen now needs to be tied down to the wooden slats. This can be done with 12 pound test monofilament fishing line or fine copper wire. This task is tedious and hard on the eyes. Nail clippers work very well for cutting the line. Start in the center of the screen by poking a 10 inch piece of line through from the bottom right next to the narrow top of a slat. Tape the back loose end to a slat. Push the front loose end through the a screen hole right next to the filled hole. The line must pass on the other side of the slat. Tie the line to the slat with a square knot (right over left; left over right) and pull it tight while pressing the screen against the mold. Secure the knot with another half hitch and trim the ends to about one inch. Tie a knot for about every four square inches of screen. Add some more in places the screen tries to lift off the slats. Replace any loose loops as you progress. Place a drop of glue or varnish on each knot and let dry. Trim the ends of the line off close to the glue with fingernail clippers. Inspect to see that all the line loops are tight and that no screen wires stick out. Place the deckle on the mold. It should be a loose fit but not slide around. The inner edge should touch the screen all the way round when you clamp the two parts together with your hands. Do not be afraid to may adjustments to the deckle if you have to and then have to touch up the finish. Thanks again for using Woodware Designs Plans. We very much want to know how you are getting along with your project and will be happy to answer any questions by e-mail.